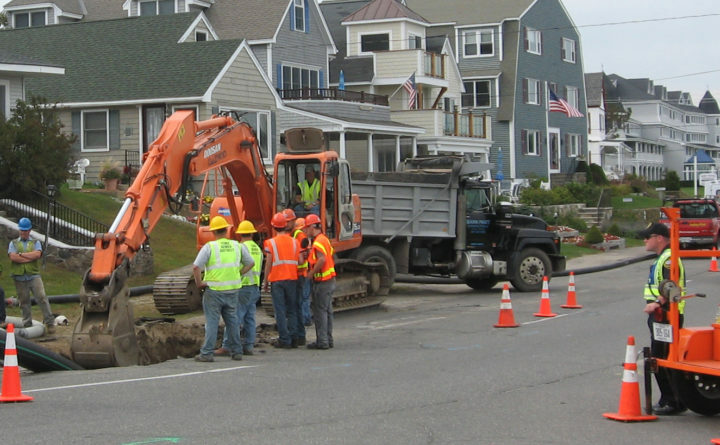 Maine’s skilled construction and utility workers using trenchless technology (pipe bursting) on a very busy road to rapidly replace 1000 feet of failing old circa 1900 clay pipe, by pulling a 12 inch HDPE new plastic pipe in through the existing clay pipe. Location is on Ocean Avenue in York Beach. AUGUSTA– Water and wastewater districts are reminded daily of the need to upgrade facilities, but storms often bring those issues to the surface; revealing troubling issues for the public. While necessary today, dumping wastewater into waterways can be stopped. Underground utilities are too often out of sight, out of mind for people until something happens. Big rain events are always at the top of our minds when our systems are working at capacity and beyond. Sewer overflows in the early spring storms demonstrate the need for improvements. Citizens are amazed that some treatment facilities have high flow plans that include the release of wastewater and stormwater into waterways. It’s something that can and needs to be fixed, but it will require more funding. The American Society of Civil Engineers (ASCE) estimates that Maine communities face $1 billion in wastewater infrastructure needs. The most significant portion, combined sewer overflow (CSO), remains the largest obligation and failure to address as a threat to public health and the environment. It was common for early systems to be “combined” with stormwater and sewer. When stormwater overwhelms a system’s capacity, they were designed with hydraulic relief points to protect downstream assets, including the treatment plant, and upstream protection such as homes and businesses to prevent backups. The result is untreated wastewater and stormwater into our waterways. The legislature has a chance to provide desperately needed funding by passing a bond if they return for a special session this summer. LD 1510, An Act To Authorize a General Fund Bond Issue To Fund Wastewater Infrastructure Projects, will dedicate $50 million. “The additional funding addresses problems throughout Maine, especially in rural towns. Providing adequate wastewater facilities serves both residents and businesses and provides for growth and jobs. We worked hard on this in the last legislative session, but we can’t afford to wait any longer,” said Haskell. The Associated General Contractors of Maine (AGC Maine) agrees with the assessment of water and wastewater advocates. “Contractors share the concern, especially when replacing broken pipes or facilities during storm events when an emergency occurs. I think the general public would share our enthusiasm for a wastewater bond if they saw the poor condition of old systems that are servicing the needs of today. An investment today will serve many generations, as proven by the number of century-year-old systems,” said Matt Marks of AGC Maine. “Like Jay, many rural wastewater treatment facilities and collection systems across the State are in desperate need of funding to replace and upgrade infrastructure that was built nearly 50 years ago with Federal and State grant money. These funds are long gone and communities simply cannot afford it on their own. This was the case back in the 1960’s and 70’s when grant funding for wastewater infrastructure became prevalent and the Clean Water Act provided funds to make desperately needed improvements. Let’s not wait until our waterways become cesspools once again to realize what clean water is really worth. Invest in clean water now,” said Mark Holt, superintendent of the Jay Sewer Department.